A couple of weeks ago I had the opportunity to witness a truly historic event—one that wove together the 18th and 21st centuries using the threads of politics, family, history and one of those beautifully produced signs you see gracing many of Paris’s historical spots. 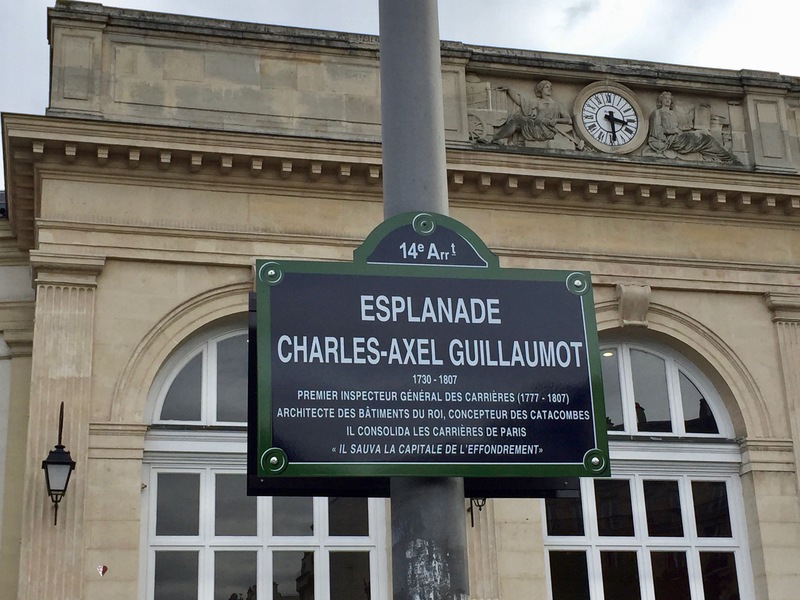 Knowing my love of history and in particular the history of the Paris’s catacombs, my friend Gilles Thomas, who has published several seminal books on the subject, invited me to a truly special event: the dedication of a city esplanade to “the man who saved Paris,” Charles-Alex Guillaumot. It had been a project of Gilles for the last five years to gain recognition for the architect responsible for buttressing the network of limestone mines beneath Paris, and his work had finally paid off. In previous posts, I describe at length the story of visiting the off-limit catacombs with Gilles, so let me summarize for you here. Before Paris existed as the city it is now, there were many mines on the outskirts…mainly for the limestone used to build the buildings you see in Paris today. At the time, that land was farmland, so no one thought about security. But as Paris grew, homes were built on top of land that had been hollowed out, and the more buildings perched atop these holes, the more dangerous it was. This oblivious co-habitation of city and deep holes continued until 1774, when a whole street of apartment buildings and homes fell through the ground. Louis XVI named a commission to inspect, chart, and reinforce the mines. (The Inspection générale des carrières or IGC.) So Charles-Axel Guillaumot (the chief inspector) and his crew went around to all of these individual mines and made tunnels from mine to mine, connecting them. They raised their ceilings from the crouching height miners were forced to work in to a height that allowed men pushing wheelbarrows to get through. They reinforced the walls and ceilings and labeled them all as they made their way through. During the French revolution, people didn’t like the idea of employing someone appointed by the king, and Charles-Axel was imprisoned in Versailles. They quickly realized how indispensable he was, however, as Guillaumot was back on the job a few years later, continuing his work until he died. Hopping forward a couple of hundred years, Gilles Thomas, in his in-depth research on the catacombs, re-discovered the architect’s importance in the history of Paris, and went to visit Guillaumot’s ancestors in Toulouse. He discovered that a portrait of Guillaumot existed in the family home, and photographing it, he finally put a face to the name for historians. But crediting the architect in his books was not enough for Gilles. 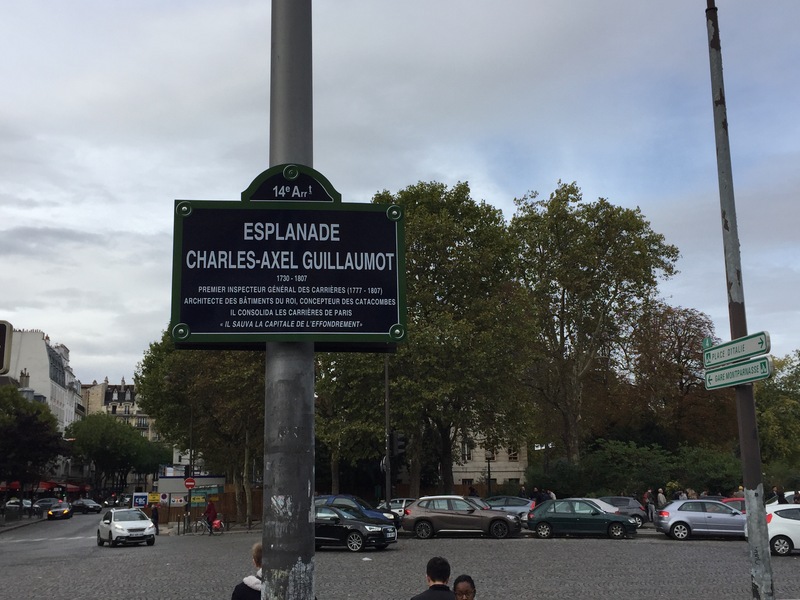 He started a campaign to dedicate a public place to the man who had, in the meantime, been christened “the man who saved Paris” by author and historian, Graham Robb. This campaign took on two of the toughest bureaucratic entities in France: the public transport system and the mayor’s office. 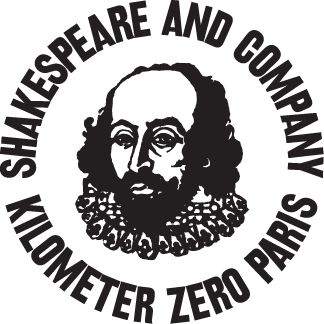 So on the evening of October 4th, 2017, representatives from both of those offices, as well as around one hundred of Guillaumot’s ancestors, gathered on the plaza just outside of the Denfert-Rochereau train station, next to the entrance of the Paris Catacombs (the Ossuary) and close to the location of the rue d’Enfer, where a house caved in the very day Guillaumot started his work on the mines. 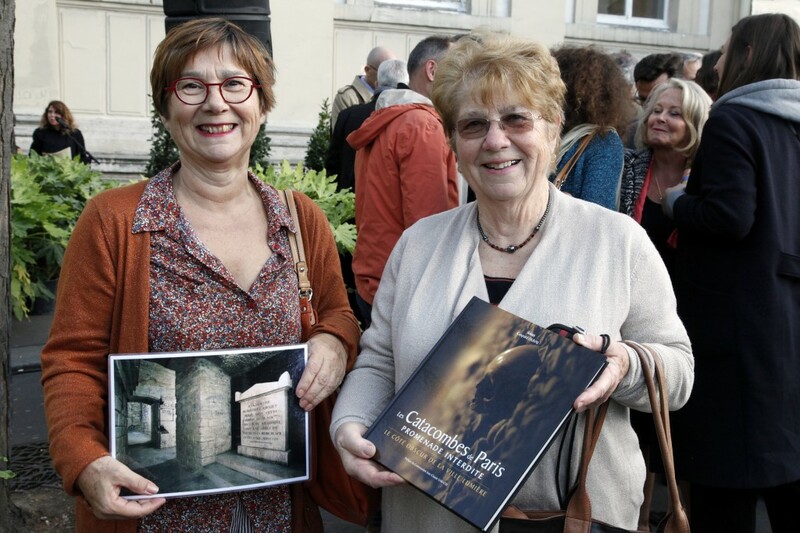 Members of Philibert Aspairt’s family with a photo of his subterranean tomb. Then Gilles introduced me to American author and fellow history-buff Cara Black, who was there to witness the historic moment. 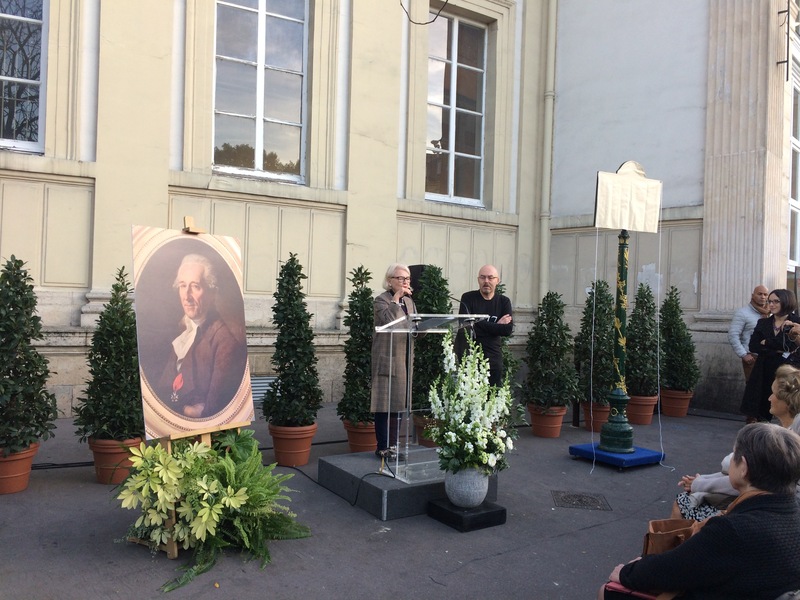 We watched the spectacle together, as Danièle Pourtaud, Conseillère of the 14th arrondissement, welcomed us all to the event. She pointed to all of the construction work being done on the Place Denfert-Rochereau behind us, saying that they were overhauling the entrance to the Catacombs’ Ossuary, and at the same time are creating, just in front of it, the future Museum of Paris Liberty. Hidden by trees, the building that will serve as the new entrance to the Ossuary as well as the Museum of Liberty. 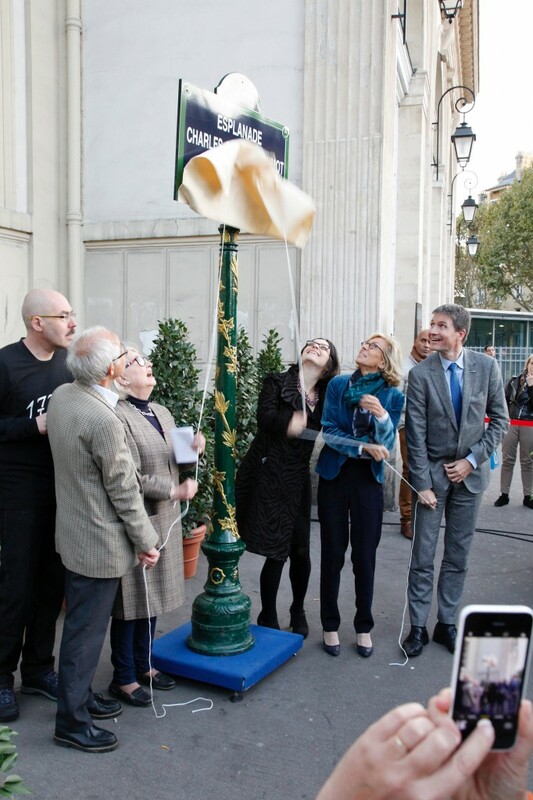 Then the Deputy Mayor of Paris, Célia Blauel, took the mic and spoke of how the City of Paris jumped at the chance to honor its illustrious citizen. 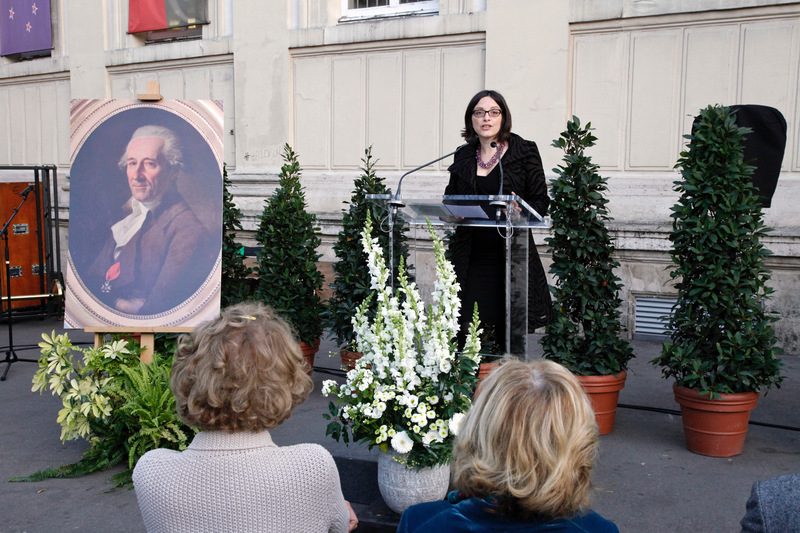 Annie Laval-Duboul, one of Guillaumot’s descendants, took the stage and told the story of Gilles visiting their aunt, of her providing him with the family’s documentation and stories that had been passed down of their illustrious ancestor. She called Gilles up to stand next to her as she told the story, and, in his regular self-effacing manner, stood next to her shrugging off the compliments and praise as it poured down on him. Her speech centered around how excited and grateful the family was that the ancestor who they had always been told saved Paris, was finally getting the recognition he deserved. 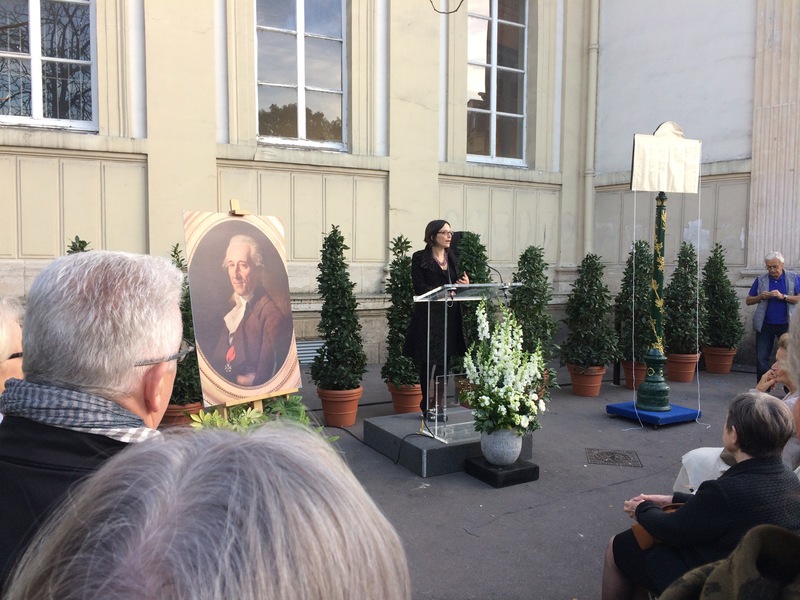 And finally, Arnaud de Jenlis, another Guillaumot descendant, took the stage and thanked many family members, several of whom held obvious inheritances from the man of the hour: they all seemed to be named Charles or Axel. The unveiling of the sign. From left: Gilles Thomas, Arnaud de Jenlis, Annie Laval-Duboul, Célia Blauel, Danièle Pourtaud, and Franck Avice. After that, the beautiful new sign was unveiled, and many photos taken. Cara and I slipped off before the drinks began pouring, leaving the major players in this important event to celebrate their success and toast to the historic day. * A special thank you to Gilles Thomas for providing me with photos from the other spectators, since my phone was out of batteries! 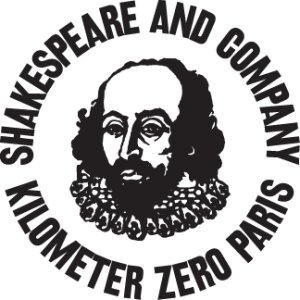 I am thrilled and honored to announce that I am hosting Shakespeare and Company’s (yes…that S&Co of Sylvia Beach, Ernest Hemingway, James Joyce, Ezra Pound… the one that was established almost 100 years ago) very first teen program: a monthly book club! 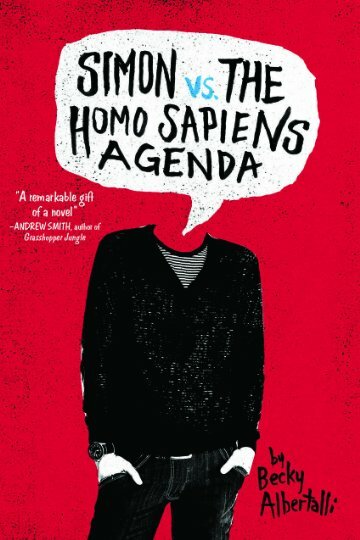 The first Monday night of every month, we will be welcoming Paris readers ages 12-18 to this free event, discussing a pre-chosen book that everyone reads before the meeting. Please come armed with your book, your highlighted passages, your reactions, your questions and your insights. 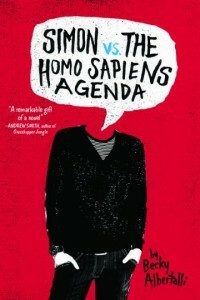 My verdict: You will laugh out loud in places, and will need a box of Kleenex nearby if you’re a crier. Don’t read the last chapters in public. You have been warned. Please spread the word to all of your Paris friends who can read and discuss books in English! Here’s a FB page to sign up for the first meeting. Otherwise, just email me to tell me you’re coming!